This giveaway is sponsored by Blue Orange Games. Enter to win your very own Blue Orange Games Dice Stack! 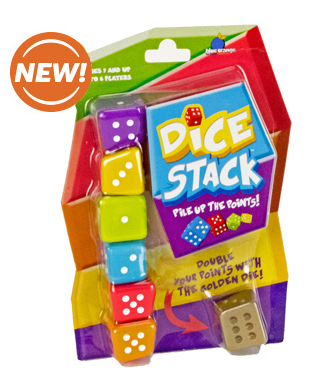 Geared for ages 7 and up, the new version is even more fun with the Golden Dice Doubler! Roll the dice, stack in numerical order, and collect your points. It’s challenging, exciting, and so much fun! Open to the US only, enter the giveaway tools widget below for your chance to win. Oh, slanted dice, it makes the mind reel! Nice game! A cool game to get the kids away from the electronics!